Milkweed is the host plant for the Monarch butterfly. Author Robert Brault writes, “Why try to explain miracles to your kids, when you can just have them plant a garden?” Young children have an innate curiosity and are masters at observation. Encouraged at an early age, they can carry these observation skills throughout their school years and beyond. Attitudes about the environment are formed early, so we should create spaces right outside their doorstep where children can learn to appreciate the wonders found in nature. Last Child in the Woods, by Richard Louv, struck a chord that still reverberates, making us realize that our future environmental stewards spend too much time in front of video screens during their formative years. This is the time when making connections with nature can ignite a passion that lasts a lifetime. Opening the door to nature can be as easy as walking across the threshold, whether to a large backyard, a small corner of the front yard, or even a balcony. 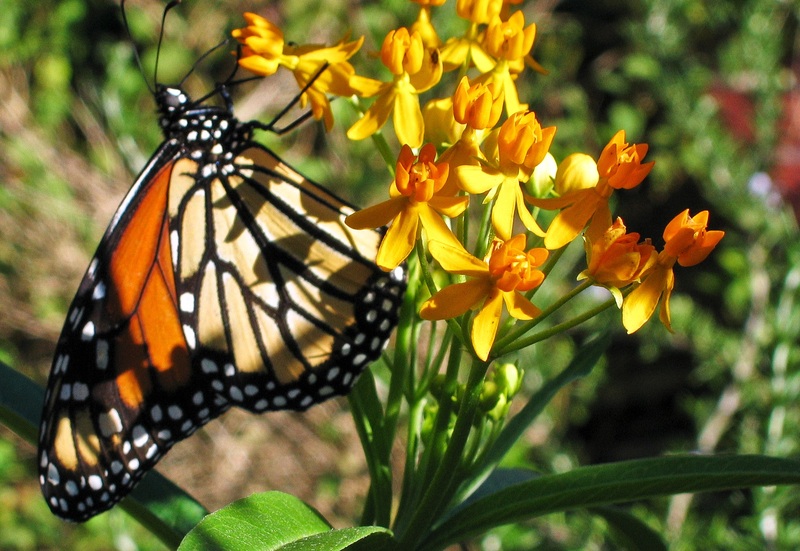 Choose some native plants: Besides introducing children to the wide variety of native plants that thrive in the Houston area, these are the plants that will attract native species of birds and butterflies. The plants and animals evolved together. Migratory birds will soon be traveling back to their breeding grounds with many of them passing through the Upper TX Gulf Coast. Providing trees and shrubs that offer food and shelter can make your yard a bird refueling stop. Include plants that are host plants for butterflies, too. For example, the Gulf Fritillary Butterfly lays her eggs on the native Passion Vine. Milkweed is host to the Monarch Butterfly. A balcony can hold container plants filled with nectar plants for butterflies or hummingbirds. Be sure to avoid pesticides and synthetic fertilizers to protect the kids and the critters. Add a log: A log at least eight inches in diameter and two feet long is a ready-made observatory. As the log breaks down, your child can observe insects, worms, mushrooms and other decomposers at close range. Using a hand lens can bring them into closer view. Turn the log towards you to see what has made its home beneath it. Compost piles also make great places for discovery. Find a listening bench: Cultivating observation skills in young children helps create lifelong learners. A bench, small chair or mat offers a place for children to quietly sit to become aware of their surroundings–listening to the beat of a hummingbird’s wings, watching a honey bee gathering nectar, or catching the subtle fragrance of Coral Honeysuckle. Help children understand animals startle easily—“the more still they can be, the more they will see.” Make this place special by allowing your child to paint his or her bench a favorite color or by finding a unique hat to wear while sitting. Create a nature journal: Budding naturalists will enjoy recording their observations in a journal. This can be as simple as a spiral notebook or as elaborate as a scrapbook. Your child may also prefer to draw. As the eye focuses during drawing, details emerge about the scene or subject that might otherwise have been missed. Be sure to record the date with each new entry. Gather supplies in a naturalist’s field pack: A simple backpack is wonderful for keeping track of the young naturalist’s supplies. Besides the journal, pencil, crayons, and hand lens, a few pocket field guides can be helpful for identifying species of plants and animals. Look for National Audubon Society First Field Guides or Peterson Guides for Young Naturalists.